Lesoir is a Dutch band that operated under the radar of progVisions until I visited the last edition of the fine iO-pages festival in Ulft, The Netherlands. When I arrived the band already was on stage and I noticed that the band had the potential to grow more into an art rock and even progressive rock direction. And that is exactly what happened. Compared to the three previous albums, this time Lesoir have put much more focus on a progressive artistic direction that prioritizes melody over blunt rage. That became also clear during a little chat that I had with the friendly vocalist Maartje Meessen during that festival. At front row we both eagerly were awaiting the band Anekdoten. Their performance turned out to be the highlight of the festival for me. But that is another story. 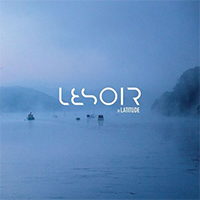 The new Lesoir album is entitled “Latitude” and will be released on the German label Gentle Art Of Music. On November 17th the band will have a CD release party at the Dutch Prog temple de Boerderij in Zoetermeer. It will be their biggest production so far. There will be special guests and the band will play together with the Spethsonian Orchestra. For the recording of “Latitude” the band quartered at Sound maestro John Cornfield’s Sawmills Studio. The Pineapple Thief frontman Bruce Soord gave his cooperation as co-producer. All this resulted in a great sounding album. However I don’t know their previous albums, it must have been a big step forward. The album opens with the song “Modern Goddess”. It starts with a delicate piano part which is later accompanied with the first vocal lines sung by vocalist Maartje Meessen. She sings this part beautifully in a way that will make you think of Anneke van Giersbergen. After this delicate part the whole band joins in and the music bursts with liveliness. In the end section I even hear a string section, great opener. In the next tracks “In The Game” and “Icon” you can hear that the heavy side of the band is still present. But these harder bits are combined with delicate sections so the needed diversity is preserved. For Prog lovers the next two songs are more interesting. “In Their Eyes” opens with a delicate acoustic guitar and beautiful vocals of Maartje Meessen. The song reminds me somewhat of the softer side of The Gathering. This beautifully sung song has strong melodies and includes several Cinematic soundscapes. Personally this song and the next one are belonging to my favorites. “Gone and Forgotten” has also a wonderful acoustic guitar intro and strong vocal melodies. You can find a video of this song on their website so I think this is a kind of single to promote the album. The combination with the string ensemble is very nice. The song works towards a kind of climax. In “Eden’s Garden” you can find some harder bits and nice guitar work. The band is combining those heavy parts with experimental soundscapes and an orchestration in the end section. The Cinematic opening of “Kissed by Sunlight” sounds mysterious. But the track has the needed diversity. In “Comforting Rain” you can find diversity in the several vocal parts. The mysterious title track “Latitude” has a beautiful opening with wonderful orchestrations. Later on you can find heavy guitars and wordless vocal parts. Another personal favorite of mine is the song “Faith Is”. The song is beautiful sung, has a nice flute part and a great orchestration. The album closes with the short song “Cradle Song”. The beautiful voice of Maartje is only accompanied by an acoustic guitar, a worthy ending of a good album. “Latitude” is a fine album full of nice melodies. The album has the so needed diversity and sounds great. Personally I prefer the songs with the delicate sung vocals which reminds me of Anneke van Giersbergen and the softer side of The Gathering. Most of those songs have also beautiful orchestrations. My personal favorites are “Modern Goddess”, “In Their Eyes”, “Gone And Forgotten”, “Kissed by Sunlight”, “Comforting Rain”, “Latitude”” and “Cradle Song”. With this forth studio album, Lesoir have put much more focus on a progressive artistic direction that prioritizes melody over blunt rage. I love the photography and new logo of the band on my special promotional copy. Therefore I would love to have a copy of the original digipak and booklet of this album that has also been released on double vinyl and digital formats.